What the school district's ambitious plan to revamp school meals will change (and what it won't). 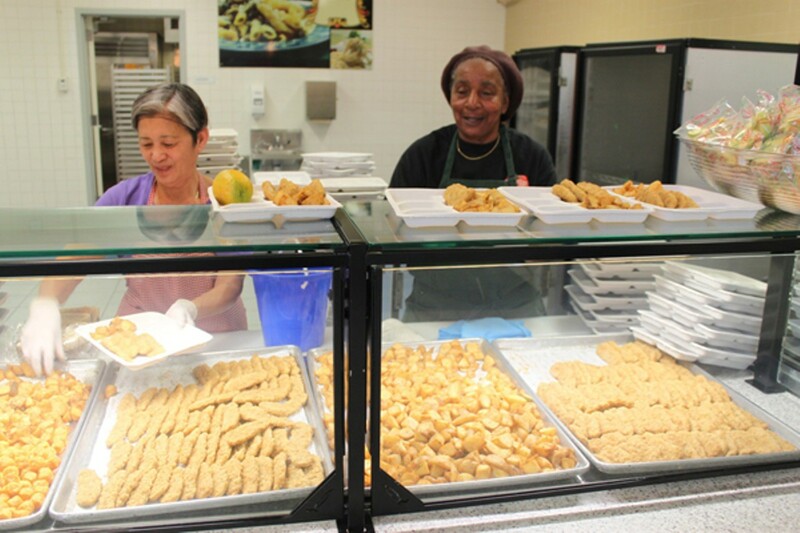 Workers at Oakland High School serve heated-up frozen foods like potatoes and breaded chicken. At Oakland's Piedmont Avenue Elementary School, lunch is served in a corner of the school auditorium, in a space no bigger than a storage closet. The de facto "kitchen" consists of a refrigerator, a warming oven (where prepackaged frozen food is reheated), and an umbrella-topped snack bar counter, where the school's 383 students pick up their meals. Nothing is really cooked here — or at any of the Oakland Unified School District's 64 "satellite" sites that lack functioning kitchens and constitute about three-quarters of the campuses in the district. Instead, meals come in individually plastic-wrapped portions — pizza, baby carrots, and applesauce on a recent Wednesday. Because the kitchen at the Piedmont Avenue school has no sinks, the school isn't able to offer a salad bar. And to add insult to injury, the auditorium doubles as the cafeteria, so lunchtime is less than sacrosanct. "They've got the band in here. ... The PTA comes here," said Shana Catherine, the school's lone food service employee. "If they have a movie day, I have to watch that movie." There's also a church group that meets in that same multipurpose room on Sundays, so every Monday morning Catherine has to rebuild and reorganize her kitchen — such as it is — all over again from scratch. Piedmont Avenue Elementary is representative of the day-to-day reality at many schools across the district. Only about one in four OUSD campuses has a working kitchen, and even at those sites a lot of the cooking equipment is outdated or unusable. As a result, most of the food is cooked —then portioned out and sealed in plastic — at one of three central kitchen facilities, two days before it's actually served. A handful of schools don't even have warming ovens, and in those cases the food is shipped out, already heated, in thermally insulated delivery boxes. Much of this is likely to change if Measure J passes on the November 6 ballot. If the bond measure gets at least 55 percent of the vote, the school district will have access to $475 million in facilities upgrade funds, roughly $44 million of which will be designated for revamping school kitchens. The proposed reforms follow the recommendations of a feasibility study conducted last year by the Berkeley nonprofit Center for Ecoliteracy. The centerpiece of the plan is the construction of a central commissary kitchen in West Oakland where ingredients will be prepped before the food is delivered to 58 schools with renovated (or newly built) "finishing kitchens." There, the final dishes will be assembled and cooked — not just rewarmed. Adjacent to the commissary kitchen will be a 1.5-acre farm that will eventually supply some portion of the district's fresh produce needs. Meanwhile, schools that already have cooking kitchens will receive equipment upgrades — under the new system, these sites will be largely self-sufficient, with several designated as school-community kitchens that will host cooking classes and other community events. None of this will happen if Measure J doesn't pass. And while there's been no organized opposition to the bond measure, and school lunch reform isn't generally viewed as a controversial topic, there also isn't any contingency plan to speak of. "If the measure doesn't pass, we have to go back and figure it all out," said school board president Jody London. The district's meals program has already received a fair share of accolades: The California Endowment recently honored Superintendent Tony Smith with an award for his work in helping lead the push toward healthy, freshly prepared food. And at a recent "Rethinking School Lunch" workshop hosted by the Oakland Museum of California, OUSD representatives were the featured panelists — held up as a model that other food service employees from around the state ought to aspire toward. The reforms that have already been implemented aren't trivial: During her tenure, Jennifer LeBarre, the district's food service director, has taken soda, trans fats, high-fructose corn syrup, and high-sodium foods off the menu. She's instituted Meatless Mondays at the elementary and middle schools. But LeBarre is forthcoming about the program's limits and describes the facilities situation as "dire." "The fact that we do not have a consistent program and a consistent experience across the district is a problem," LeBarre said. "We have the expectation that we're going to have qualified teachers and textbooks and school supplies in every classroom. We need to have that same expectation in having a quality meal program at every school." In particular, the district still has a long way to go before it reaches LeBarre's stated goal of reducing pre-cooked, prepackaged foods to 20 percent of what is served. She estimates that right now that number hovers closer to 50 or 60 percent. At Oakland High School, for instance, a hard-working staff of fifteen cranks out a thousand meals a day for the school's own students while also supplying food to fifteen other schools and twelve child development centers. During a recent visit, the food service staff showed off a fully stocked salad bar and a couple of "daily specials" that had been cooked in-house: a chicken salad pita wrap made with chicken that was just poached that morning, for example. Still, most of what was served on this particular day was standard-order, Sysco-supplied frozen food, taken straight out of a box and heated up: seasoned potatoes, breaded chicken cutlets, and such. One of the lead cooks shared her long list of daily tasks, and only a couple items were "freshly cooked": a tomato salsa and the rice component of a barbecue chicken stir-fry. Quesadillas and grilled cheese sandwiches were precooked and frozen; pinto beans came straight out of a can. For the idealist, "from scratch" cooking implies tomato sauce made from just-picked heirlooms and stirred for hours over a low flame — the kind of food that celebrity school food reform advocates like Alice Waters or Jamie Oliver would serve at a backyard luncheon. But LeBarre made it clear that the district's plans are nothing if not grounded in the practical realities of having to serve 38,000 students each day, so "from scratch" — as defined by OUSD — is always going to be somewhat of a relative term. Tomato sauce will always come out of a jar, but the cooks are already adding herbs and spices and fresh vegetables. Frozen chicken tenders and pre-packaged cheese burritos probably aren't going anywhere. The staff at the new commissary kitchen still isn't going to bake fresh bread; it isn't going to soak beans overnight. OUSD just doesn't have the budget or the staff to do that kind of home-style cooking on a mass scale. Meanwhile, the food distributor behemoth Sysco is likely to remain the district's biggest supplier for the foreseeable future. But, as LeBarre pointed out, "Sysco is like our grocery store. When you go to your grocery store, you decide what aisle to shop on." She stressed that OUSD has already begun to source many of the healthier items that Sysco has in its inventory: multigrain sandwich buns, whole-wheat pastas, and a variety of spices. If the new facilities upgrades are successful, more and more of the food served district-wide will be cooked fresh the same day it's served — even if canned and pre-cooked (even lightly processed) ingredients are still incorporated. "School food reform is not separate from school reform," Superintendent Smith said in a statement released earlier this year. "It's part of the basic work we have to do in order to correct systemic injustice, pursue equity, and give our children the best future possible." By now it's well established that children who don't eat well aren't in the best position to succeed academically. What's clear, at least at Piedmont Avenue Elementary, is that administrators and kitchen staff are all primed for a change. 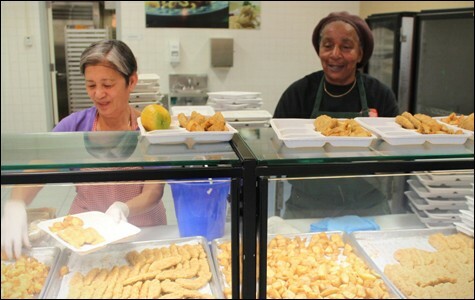 What Catherine, the cook, and Zarina Ahmad, the school's principal, share in common is that their mothers both worked in food service for OUSD. Both recalled how in the old days, their mothers cooked real food — "what they're trying to bring back," Catherine explained. "When [my mom] came to school now, she thought it was like bird food." Catherine said her mother would talk about how she had to stir oatmeal in the mornings; Ahmad said her mom used to roast multiple whole turkeys for Thanksgiving. It's a quaint picture of the past, and the truth is, it's unclear whether the future of school lunch in OUSD will look exactly like that. The proposed changes don't promise a utopia. In the best case scenario, four or five years from now a new kitchen and cafeteria will be installed at the Piedmont Avenue school — most likely in a trailer or some other modular unit. There will be a salad bar and a dishwasher and stainless steel flatware, and what's served will be a mix of prepackaged food and food that's made at least partly, but not completely, "from scratch." Instead of plastic-wrapped personal pizzas, whole-wheat pizza dough (and toppings and tomato sauce) will come in from the new central kitchen so that it can be baked fresh each morning — the smell of it wafting in, perhaps, through open classroom windows. That, in itself, would be something. A 1960s-dinner party-themed cocktail bar and restaurant is set to replace Michel Bistro. Berkeley’s Sobremesa guides food-focused trips to Spain and Japan.